Not surprisingly, the optical requirements of a tactical shooter wining a 3-gun stage are the same as a hunter stalking dangerous game: a tough scope, superb glare- resistant glass, and a sleek, snag-free profile. The incredibly resilient Burris MTAC riflescopes provide all that and more. With compact models perfect for CQB or big game stalking, to high-power models ideal for mid- to long-range tactical shooting, MTAC has you covered. Featuring high performance glass, solid one-piece tubes, and internal double-spring tension assemblies, you can take your MTAC into the harshest shooting environments. Rest easy – its warranty is forever. The Burris MTAC 6.5-20x50mm Hunting G2B Mil-Dot Reticle Riflescope 200471 is the perfect scope for long distance tactical shooting. This Tactical Riflescope by the specialists at Burris is made with index matched, HiLume multi-coated lenses for incredibly sharp and clear images. 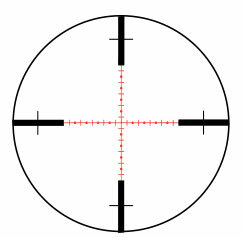 The Burris 6.5-20x Mil-Dot G2B Reticle MTAC Rifle Scope is made with an extremely efficient G2B Mil-Dot reticle for precise aiming, distance measurement, holdover and hold off. The MTAC Mil-Rad windage and elevation knobs on this Burris Rifle Scope are adjustable and resettable using only your finger, so you will not have to fumble or constantly adjust your settings. The matte finish on the Burris G2B Mil-Dot 50mm MTAC Rifle-Scope helps to keep you hidden from whatever lies ahead. MTAC Mil-Rad knobs with finger-adjustable dials for windage/elevation.